When British Columbia joined Confederation it was so remote from the rest of Canada that mail going east had to carry an American stamp and go through San Francisco. The colony was large and rich in resources, but its population was small, perhaps only 11,000 Europeans and about 26,000 Indigenous people. With a British naval base in Esquimalt and a series of gold rushes in the interior, the fur trade economy had given way to coal mining, lumbering, fishing and a rising merchant class. But a large public debt, economic depression following the end of the gold rush, and political unrest pushed the colony to consider making a change. Just as in other pre-Confederation colonies, union with Canada had its opponents in B.C. A small faction sought to solve British Columbia's financial problems by annexation with the United States where a great deal of their trade orientation was aimed already. Others, like J.S. Helmcken, son-in-law of James Douglas, wanted to maintain the British connection. Helmcken felt that B.C. was geographically too distant from the rest of Canada for proper communication with the east. B.C. would have little political influence, he argued, and would be subject to policy decisions made far away. This is still a concern of westerners today. The eccentric newspaper publisher, Amor de Cosmos, who was to become an early premier of the new province in 1873, was a strong supporter of Confederation. From his point of view it was the only way British Columbia would achieve responsible government, something reformers had been arguing for without success since the 1850s. 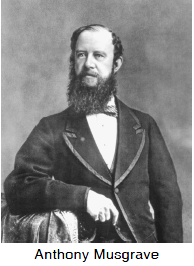 Governor Anthony Musgrave was a friend of John A. Macdonald's and shared his vision of Canada. Britain was ready to give up control of this remote, increasingly expensive colony and Musgrave's job was to overcome the opposition and smooth the way for Confederation. He sent a delegation to Ottawa, among them the skeptical Helmcken, and much to their surprise, all their terms were accepted. Canada would take over all the debt of the colony and pump money into the province annually for public works. Responsible government would be implemented in the province and B.C. would also be allowed to send six members to Parliament in Ottawa instead of the two or three it was entitled to with rep by pop. The biggest surprise was Cartier's generous offer of a transcontinental railway line that would penetrate the Rocky Mountains and join B.C. to the east within ten years. The delegates had only asked for a wagon road! The railway promise provoked a lot of opposition in the east because it was such a massive, expensive undertaking and most of the land between B.C. and Ontario was barely inhabited. Without it, however, we probably wouldn't have been able to establish a country. On July 20, 1871, British Columbia entered Confederation as our sixth province, extending the young Dominion of Canada to the Pacific Ocean.